Caliber Home Loans doesn’t offer banking or investing services, meaning you can’t bundle your mortgage with other financial accounts you have. Caliber Home Loans is a full-service mortgage banking company, headquartered in Irving, Texas. It is a direct lender, seller and servicer. Caliber Home Loans focuses solely on mortgages, differentiating it from large banks with multiple departments and more diversified ranges of financial service. With more than 3,500 employees, it’s a mid-size lender when compared to big banks like Wells Fargo which has more than 200,000 employees. In 2013, two companies, Caliber Funding and Vericrest Financial, merged to form Caliber Home Loans. The company is jointly owned by Lone Star V and Lone Star Fund VI, which are affiliates of private equity firm Lone Star Funds. In July 2016, Caliber Home Loans acquired First Priority Financial, to expand its mortgage licensing to all 50 states. The company launched the Caliber Ultimate Home Buying Experience in December 2016. The service is said to help streamline the application, approval and closing experience for loans by making the process more efficient. According to Consumer Finance Protection Bureau (CFPB) data, in 2015 Caliber Home Loans had a total loan volume of $18,042,362,000. Does Caliber Home Loans Operate in My Area? Caliber Home Loans offers loans in all 50 states as well as the District of Columbia. What Kind of Mortgage Can I Get With Caliber Home Loans? Fixed-rate mortgage: The interest rate is set with this type of mortgage, meaning your monthly payment will remain consistent through the full loan period, unless you decide to refinance. Loan periods for fixed-rate mortgages are typically between 15 and 30 years. If you plan to stay in the home for this length of time and want a consistent payment, a fixed-rate loan might be a good option for you. Adjustable-rate mortgage (ARM): Adjustable-rate mortgages feature a lower interest rate during the first one, three, five, seven or 10 years of the loan. After that time, the interest rate can increase or decrease, though it generally goes up. It is worth noting that the interest rate cannot rise above a certain level that is specified in the loan’s terms. ARMs are typically less predictable than fixed-rate loans because they can change with market fluctuations. Because interest rates are lower initially with this type of loan, borrowers who don’t necessarily plan to own their home on a long-term basis might choose an adjustable-rate mortgage instead of a fixed rate mortgage. Fixed-rate and ARM loans are considered conventional loans, which means they are not insured or guaranteed by a government agency. Homebuyers with high credit scores and solid employment histories are the best fit for this type of low interest mortgage. HomeStyle® Renovation loan: These loans offer assistance to those in need of home upgrades or repairs. HomeStyle renovation loans fund renovations equaling up to half of the home’s post-renovation value. Caliber Home Loans offers fixed-rate or adjustable-rate HomeStyle renovation loans. Home Possible® loan: This Freddie Mac loan program helps borrowers with credit scores as low as 620 obtain a mortgage. Down payments can be as little as 3%, and homebuyer education is mandatory for first-time buyers. This type of loan comes with the possibility of an “Affordable Second.” This is a secondary loan from a state or county agency, or a nonprofit. HomeReady™ loan: This is a Fannie Mae program for buyers with limited incomes. Down payments can be as low as 3% and can be paid by gift funds or your employer, if that’s an option for you. Even properties in high-cost areas may qualify for this type of loan. Jumbo loan: These mortgages are meant for high-priced homes. Jumbo loans provide funding for properties priced above the conforming loan limit in a particular county. In most areas, the conforming loan limit is $417,000, meaning if you take out a home loan over this amount, you will have a jumbo loan. However some areas with higher real estate prices will have conforming limits of up to $625,500. In these counties, you will have a little more leeway before your mortgage is considered a jumbo loan. Caliber Home Loans provides jumbo loans in both fixed-rate and adjustable-rate options for up to $2.5 million. Down payments begin at 5%, depending on the home’s purchase price. Jumbo interest-only adjustable-rate mortgage (ARM): Caliber Home Loans’ jumbo interest-only adjustable-rate mortgage has a lower monthly payment during the first five to 10 years of ownership. The buyer will only pay the interest during this period. This is ideal if you prefer a lower monthly payment in the first years of the mortgage. It’s also beneficial if you plan to sell the property after a few years. Like other jumbo loans, jumbo interest-only ARMs offer funding for homes priced at up to $2.5 million. The minimum credit score is 700 for this type of loan. FHA loan: The Federal Housing Administration insures FHA loans. These mortgages reduce the risk lenders face when lending to those with lower credit scores or limited financial resources. Caliber Home Loans offers FHA loans in fixed-rate and adjustable-rate options with down payments of 3.5%. For fixed rate FHA loans, Caliber only asks for a 580 credit score. FHA 203(k) Fixed Rate Rehab: This type of loan provides additional funding before move-in to allow you to buy a home that needs repairs or renovations. There are two options: “standard,” for remodeling and repairs, and “limited,” which is for minor remodels and non-structural repairs. A minimum credit score of 620 is allowed for FHA 203(k) Fixed Rate Rehab. You will need to finance at least $5,000 of the renovation work. USDA loan: The U.S. Department of Agriculture (USDA) backs this type of loan. USDA mortgages offer borrowers in rural or underdeveloped areas a low down payment option (as low as 0% in some cases). You may be eligible for a USDA loan if the property is in a designated rural area and you do not qualify for a conventional loan. VA loan: The Department of Veterans Affairs provides backing for VA loans. VA loans are not subject to a minimum down payment and come with a number of other favorable loan conditions. If you’re a veteran, military or National Guard member or a surviving spouse, you may find that a VA loan is the best option for you. Caliber Home Loans offers both fixed-rate and adjustable-rate VA loans with varying credit score requirements. Those with credit scores ranging from 580 to 619 are eligible for fixed-rate financing but may face more strict terms and conditions, while those with a credit score of 620 or above are eligible for an adjustable-rate VA loan. Refinance: Whether you want to refinance for a lower interest rate, or you need cash to pay off other debt, Caliber Home Loans offers a wide variety of options. Choose between: conventional, FHA streamline or cash out, VA streamline or cash out, USDA streamline or HARP. Caliber Home Loans offers information on each type as well as loan officers to assist you in your choices. The following mortgage options are not government standard loans or conventional. Caliber Home Loans calls the following options its “Portfolio Lending Program.” The options are unique to Caliber, while the other loan options previously mentioned can be found at a variety of lending institutions. Premier Access loan: If you’re trying to buy or refinance a high-value property and don’t qualify for a jumbo loan, this may be your best option. Down payments can be as low as 10% with no additional mortgage interest requirement. Credit scores of 660 and above qualify. Homeowner’s Access loan: If your lending history disqualifies you for most loans, this is one of your alternatives. Chapter 13 bankruptcy, late mortgage payments and short sales don’t preclude you from this loan. A minimum credit score of 620 is required and your debt-to-income ratio can be up to 60% with compensating factors. Fresh Start Program: Similar to the Homeowner's Access loan, this option is for those with troubled lending history. You can have a foreclosed home, short sale, deed-in-lieu or bankruptcy in your past and still qualify for a loan. Your credit score needs to be 580 or above, and the loan can be for $100,000 to $1 million. Down payments start at 15%. Investment loans: With this option, you can purchase an unlimited number of investment properties. You need a credit score of 620 or higher, and a down payment of 30%. Both fixed-rate and adjustable-rate mortgages are offered with investment loans. Foreign national loans: If you often visit the U.S. and want to own a home rather than stay at a hotel or rental, this program is an option for you. Loan amounts start at $200,000 and top out at $2 million. You don’t need a domestic credit score but you will need a 30% down payment. 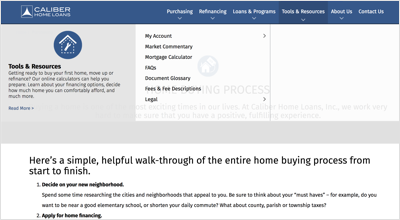 What Can You Do Online with Caliber Home Loans? You can find a wealth of information on Caliber Home Loans’ site. There are step-by-step guides to the home buying process, a glossary of terms, an explanation of fees, information for every type of loan offered by the company, as well as market commentary. Plus, most common questions you may have about the process probably have an answer in the Caliber Home Loans’ FAQ section. You can find the closest loan consultant by clicking a map feature or by inputting your information in a contact form. If there are no loan consultants in your state, you’ll be matched with a centralized loan consultant who is licensed for your state. After an initial consultation, you may be able to get pre-qualification based on your income and debts. Unfortunately, you can’t initiate the loan application process through the site. And you won’t be able to register for an online login until you have an actual loan number. However, Caliber Home Loans does offer what it calls, “the Ultimate Home Buying Experience.” After initiating the application by calling or visiting a loan consultant, you can authorize Caliber to electronically verify necessary financial information. This includes income, bank statements and employment and property information. Caliber Home Loans prides itself on a fast path to closing, sometimes even as fast as 10 days after applying. Once you actually have a loan from Caliber Home Loans, you can use the site to make payments and track your loan balance. Would You Qualify for a Caliber Home Loans Mortgage? With Caliber’s wide variety of loan options, you stand a good chance at qualifying for a loan with this company. Caliber Home Loans looks at a number of factors when determining if you qualify for a loan. One of the first considerations is your credit score. A “good” credit score generally falls near 700 and increases your chances for a conventional loan. Anything near 600 or below, in the “fair” range, will likely need a government-backed loan, such as an FHA, or one of Caliber’s other options, such as the Fresh Start program. Credit score isn’t the only financial factor that Caliber Home Loans will consider. Your income, debt levels and down payment savings will also affect your ability to obtain a loan. Generally speaking, a down payment of 20% of the cost of the home is required for a conventional loan. You can put less money down if you’re willing to pay mortgage insurance. For conventional loans, you need private mortgage insurance (PMI). FHA loans, which require only a 3.5% down payment, come with mortgage insurance premiums (MIP). The MIP is set by the government and help insures the loan for the lender. Another important factor is your debt-to-income ratio. Your debt-to-income ratio is calculated by taking your monthly liabilities, such as credit card, auto or student loan debts, and dividing them by your gross (pre-tax) monthly income. For example, let’s say your salary is $50,000 a year, which means you make $4,166 a month pre-tax. You have a car payment of $350, student loans totaling $550 and pay $425 for credit card debt. Your total debt per month is $1,325. That figure, divided by your income, $4,166, equals 0.318 or roughly 32%. That percentage is your debt-to-income ratio. The number helps depict how much income you have available for monthly mortgage payments. Many mortgage lenders accept a maximum debt-to-income ratio of 43%, but you’ll increase your chances for a conventional loan with a lower percentage. Caliber does offer programs, such as the Homeowner’s Access loan that allows borrowers to have up to 60% debt-to-income ratio. What’s the Process for Getting a Mortgage With Caliber Home Loans? Prior to starting the application process, you can research your options on the company’s website, so you have an idea of potential loan offerings. There’s also a page that explains the home buying process from start to finish, so you can get an idea of the necessary steps. To start the application process with Caliber Home Loans, you need to find a loan consultant in your area, fill out an online contact form or call the central phone number. After you find a home to purchase, a loan officer reviews your financial situation. Some of the documents you may have to provide include pay stubs, tax returns and recent bank account statements. After analyzing your financials, the loan consultant will tell you which loan products you qualify for and can help you decide which is the best fit. Next Caliber will have your house professionally appraised and then you can move to the final step: closing. Your loan consultant will give you a closing disclosure that states your home’s financing, what money you owe at closing and other loan conditions. During the closing process, you’ll spend about an hour signing paperwork. You may have a closing agent present as well as a title company representative, the seller, your real estate agent and sometimes an attorney. The closing agent should be able to answer any questions or concerns you have during your review of the documents, but it’s always helpful to do your research beforehand. This fast-growing company has only offered loans since 2009, and officially became the Caliber Home Loan brand in 2013. For a relatively new company, it’s grown to $81 billion of serviced loans and increased loan volume over 234% from 2014 to 2015. 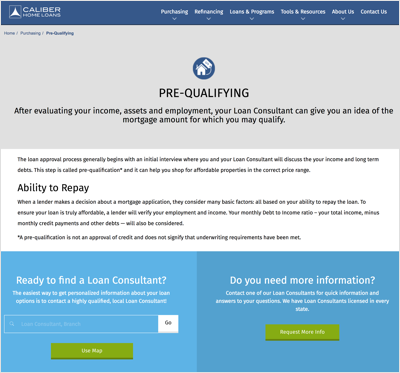 With the launch of a streamlined application process late 2016, Caliber proves its commitment to offering the quickest loan process. In fact, the company boasts 10 days from application to close in eligible situations. That’s weeks ahead of many other lenders. Caliber Home Loans originates loans in all 50 states and the District of Columbia, which makes the company widely available. Most states include multiple loan officers so you can talk to a consultant in person, rather than only over the phone. However, one downside is that the company only offers loans, no other banking or financial services. If you like to bundle services, you won’t have that option with this company. Additionally, the online options don’t stack up with some competitors. Caliber doesn’t offer an app for easy phone access for payments and processing. You also can’t prequalify for a loan or start the application process online. You have to initiate the loan process directly with a loan consultant. While Caliber does offer an online account, it’s not available for customer use until you have a loan number. One of Caliber Home Loans best features is a wide variety of loan options. It’s one of the most robust companies in that regard. Offerings include multiple types of refinances and mortgages for all different qualities of borrowers. Those who have bad credit, bankruptcy or other financial mishaps in their past may find themselves eligible for a loan with this company. Rather than offering only government-backed options, Caliber has its own suite of lending for unique borrowers. A quick way to decipher which mortgage lenders have higher fees and closing costs than others is by comparing their interest rates and APRs. Simply put, the larger the split between these percentages, the more you'll pay in fees to make up the difference. If you want more insight into various mortgages, the lenders that provide them and how well they'll fit into your life, a financial advisor might be worth consulting. Most of these professionals deal with some sort of comprehensive financial planning, which is extremely useful for anyone introducing monthly mortgage payments into his or her life. To find a financial advisor in your area, with the experience to aid your personal situation, check out the SmartAsset financial advisor matching tool, which can pair you with as many as three such advisors.